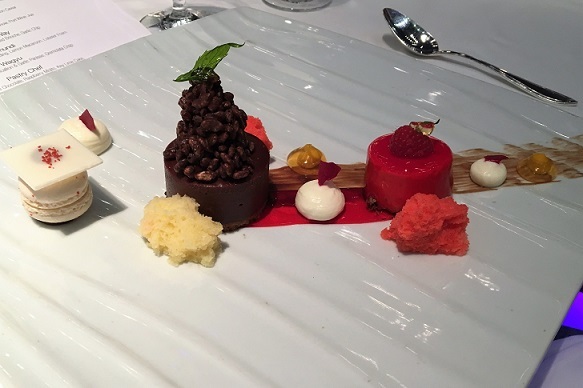 I make no secret of my love of food, so I was super excited to have the opportunity to try a degustation dinner on our recent Carnival Legend cruise. The Chefs Table! Most cruise lines will offer some variation on The Chefs Table. I’d like to share our Chefs Table dinner with you. I don’t want to spoil the show by writing too much, but it’s quite impossible to describe the tastes and smells and textures of a great meal adequately on paper anyway! Hopefully though, I will whet your appetite for a new experience at sea. You don’t need to be any sort of serious foodie to enjoy The Chefs Table. Anyone with an adventurous palate and an interest in good food will enjoy the evening. You can book your place at the Chefs Table even before you board your cruise (via your travel agent, or email Carnival direct). We did this as numbers are limited and we didn’t want to miss out! Your night is allocated once you are on-board. Just wait for your invitation to be delivered to your stateroom. Don’t eat too much on the day of your dinner! There is SO. MUCH. FOOD!You will want to start on an empty stomach to have any chance of fitting it all in! Covered, flat shoes are recommended. Wear what you like but the suggestion is there for your own safety as the galley floor IS slippery. Forewarned is forearmed. Our invitation instructed us to meet our host at 6pm. Dress code was the same as that for the rest of the ship on that night (Cruise Casual for us). An intimate evening is guaranteed with just a small gathering of diners (13 in our group). We are introduced to the Sous Chef who is our guide for the evening. The Sous Chef is second in command of the team of chefs on the ship. Chef is a welcoming host and is happy to answer any and all questions you can possibly throw at him. It is a privilege to enter The Galley, to see exactly how this well-oiled machine passes out 1000’s of meals each seating. It is fascinating! We get to spend some time in the Galley while the dinner service runs. The Sights, Sounds and Smells emanating from here are a theatre for the senses! As Champagne was passed around the taste sensations began. Call them Amuse-Bouche, or Hors-D’oeuvre as you will, we enjoyed 4 tasty bite-sized morsels each. They all danced on the tongue and did what they should do, stimulated our palates for more! Once our tastings were over, Chef provided a personal cooking demonstration for our eyes only. The highly prized Carnival Melting Chocolate Cake was whipped together in minutes. How easy he made it look, so much so that I will try it at home one day. Table decorations of fresh vegetables and herbs set the scene for the Chefs Table. Our places are set with our names, and menus are tied together with a Star Anise flourish. Our appetites have been piqued by the starters and anticipation is high. Everyone is excited to see what culinary magic comes next. There is a nice relaxed atmosphere with our group of fellow diners. Conversation is easy, but there is enough space to feel comfortable just talking with your partner if you prefer. Our host is attentive to all needs, with wine (a choice of red or white) and water (still or sparkling) consistently replenished throughout the evening. 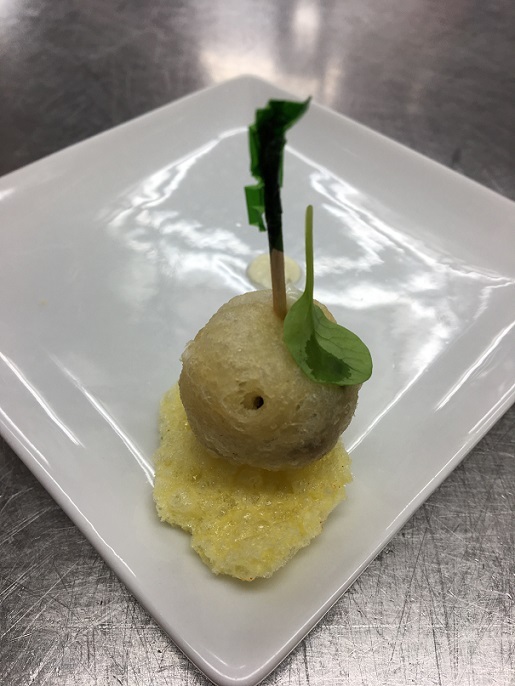 The pace of the night, food courses interspersed with stories and descriptions of the food as well as a guest entertainer flows smoothly. We also get to meet the Executive Chef, head of all things food on-board. He is an interesting man, with many tales to tell. We are also invited to go up and watch the food being plated whenever we desire. After dinner, tea and coffee is offered and we are presented with our souvenir photograph just after 9pm. 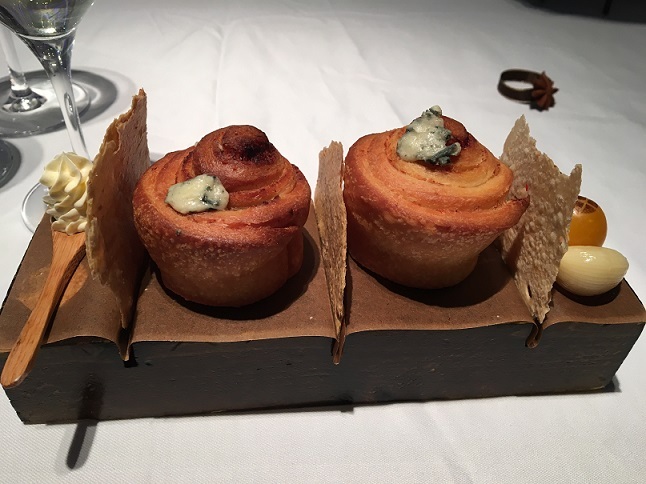 We are spoiled with 8 Courses, including a bread board to start and the Dessert course to finish. Presentation of every dish was stunning. The attention to detail was second to none, and sometimes the food looked too good to eat (but eat we did)! As we were served, Chef would explain all the intricacies of the ingredients and their construction. 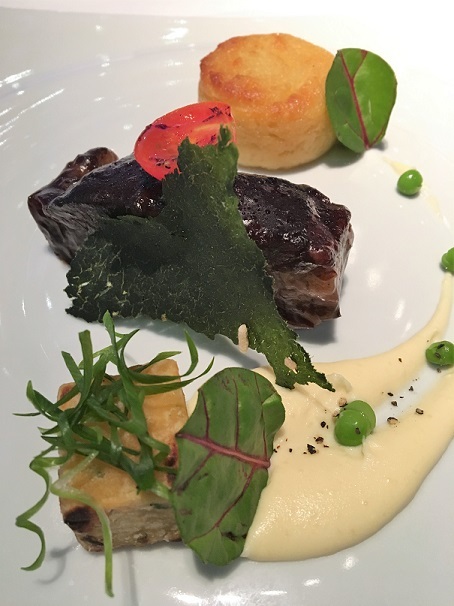 Every dish featured numerous elements elegantly linked through their flavours, to create the final plate. We got to taste well known ingredients (fish, beef, and tomato) in new and inventive ways. And we got to taste some things we would never have dreamed of creating (corn custard, garlic chips, bone marrow soufflé). All the courses were delicious, super satisfying and fun to eat. Funnily enough for a dedicated carnivore, I actually have to rate the Tomato Bisque as my favourite course of the night. A strange criticism to make, but we actually thought there was just too much! We both struggled with the final savoury course, and we really couldn’t enjoy the dessert plate as there was just no room left in the tank! Maybe we should have had less wine and water (haha). I highly recommend the Chefs Table experience, and I intend to book again on our future cruises. I’m looking forward to comparing how various Cruise Lines run their Chefs Tables. 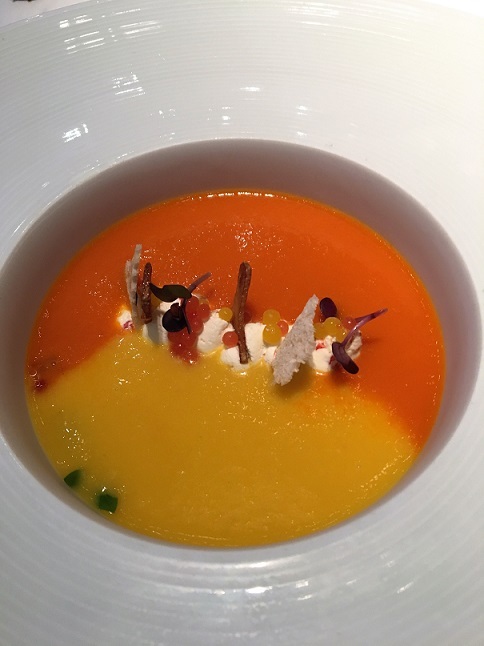 If you like food to be a bit of an adventure, give The Chefs Table a go on your next cruise.